With elections looming, lawmakers and the governor abandoned work on a balanced budget and passed a six-month stopgap budget instead. The spending plan comes after a year without a budget and will get the state through the November election and into the lame duck fall session. Speaking after the bill passed, Gov. Bruce Rauner said he's got his eye on the future. The stopgap budget sailed through the General Assembly by a huge margin. Only four lawmakers voted no: Reps. Jack Franks (D-Woodstock), Jeanne Ives (R-Wheaton), David McSweeney (R-Cary) and Thomas Morrison (R-Palatine). They join “Chicago Tonight” to explain their decision. Republican leaders said the stopgap was a win for taxpayers. McSweeney said he agrees with Rauner, who said it’s an unbalanced budget. June 30: For the first time in a year, there is a state budget, albeit a temporary one. There is also relief for Chicago Public Schools, but with some caveats. Springfield reporter Amanda Vinicky joins us with the latest. 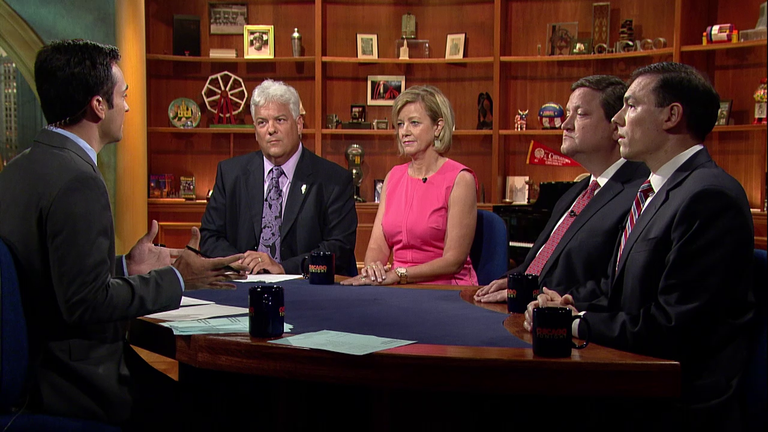 June 29: A day of special session for the Illinois House and Senate ended with no significant action on a budget agreement. Amanda Vinicky shares details of what’s been happening behind the scenes. June 29: Chicago Teachers Union president Karen Lewis talks about what may be happening in Springfield to help CPS and what it could mean for contract negotiations.